Are you looking for wedding invites that captures the spirit of your dream wedding? Do you want them to give your guests an enticing first glimpse of your upcoming big day? Then you’re in the right place. With bespoke wedding invitations there’s a real opportunity to create some truly special and unique that fits with your wedding vision – From bringing in floral details from your bouquet to an illustration of your stunning venue. Or maybe you're looking for some bold modern invites with white ink on dark paper stock? Handmade vow book with a silk ribbon detail. Vintage rose wedding invites with a peony illustration, matching gold peony wax seal and finest paper yarn details. Taking inspiration from your wedding story and the life you’re creating together I will work with you and your vision to design a unique suite from scratch – from sketches to the final wax seal detail. Marrying that perfectly imperfect handmade touch of calligraphy with elegant timeless design and delicate details. I aim to create effortlessly beautiful keepsakes for you to reminisce over for years to come. Each bespoke invitation suite starts with hand drawn sketched concepts. The sky is the limit! Complete my bespoke stationery form, share your overflowing Pinterest boards (I adore Pinterest so don’t be shy with your ideas and inspiration) and let’s start by chatting through your ideas. After you’ve shared your big dreams, wedding vision and potential needs and no-no’s I will share a proposal and pricing based off your priorities and budget. Next, it’s time to turn that inspiration into your dream suite. We’ll go through sketched concepts, printing methods and gush over the details that bring it all together. Don’t worry if your initial ideas have evolved, we’ll work through all of that to make sure your suite is perfectly tailored to you. After you have approved the concept I will get into all those flourished details and calligraphy strokes that will make your wedding suite frame-worthy. You’re in love with your proof and it’s time for some printing magic. Whether you’ve opted for elegant letterpress, eye-catching gold foil, dramatic white ink or flat printed watercolour effects your suite is getting ready to enchant your wedding guests. Oh, and if you need some thoughtfully assembled details or calligraphed envelopes to make your invites stand out amongst the usual bills and banking letters I’ve got your back. Pop the champagne and do a little dance as the excited RSVPs are coming in. And if you need some unique memorable calligraphy touches to add to your special day I’ve got you covered there as well. Let me serve you up with some lovingly crafted details that goes delightfully well with your bespoke suite. Wrapping it all up with a perfect silk ribbon. Need inspiration for your invites? 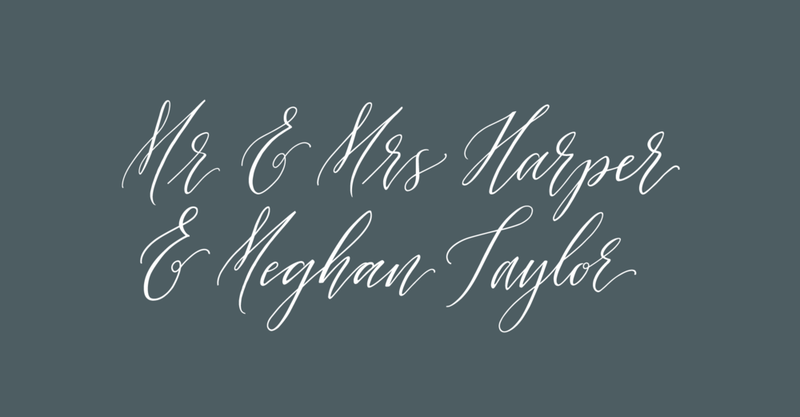 Have a look at a selection of my bespoke wedding and event calligraphy work here. Dramatic silver ink on black paper stock for a modern city wedding. The pricing for a bespoke suite can vary greatly depending on your desired quantity, materials, printing method and added details. Each bespoke suite is custom quoted based on your needs. The majority of couples choosing a bespoke suite make an average investment of £600 – £1,200. However, I can work with budgets outside these limitations. If you provide me with a budget that you have in mind I’m happy to look at that, your needs and desired details and provide you with options on how to achieve your dream stationery. I only take one a few bespoke projects a year as I want to ensure I give each of my clients the attention to detail they deserve. I recommend booking at least 3-4 months in advance to avoid disappointment. Amazing, let’s design some invites you’re proud to send off to your guests. Complete my contact form via the link below (or send me an email at hello@mathildalundin.com) and I’ll be in touch within two business days. Ready to get to know you and your wedding story better and get started on that bespoke quote. The bespoke process typically takes around 8 weeks, sometimes a bit longer. It will all depend on design complexity, your preferred printing method and if you want those extra mesmerising calligraphy details such as bespoke wax seals or envelope calligraphy. I encourage you to plan ahead but don’t be afraid to reach out even if you’re cutting it a bit close to the deadline. I will do my very best to work some magic for you. You will get your own personal space in my Dubsado workflow. This makes it easy and accessible for you to add your feedback right next to the designs. Up to three rounds of revisions are included in the design fee, which is usually more than enough. But don’t worry if you still feel like there’s some little tweaks that need to be perfected. Further adjustments can be requested for a small fee to ensure you’re completely head over heels in love with your invites. I absolutely adore one of the suites on your site. Can I have it as it is? Of course! If it’s one of my semi-custom suites that you want to make your own you can simply choose that design as the starting point. I can then update it with your preferred colour and printing options to make it perfect for your wedding. If it’s something I’ve designed for a shoot simply share the photo with me and I can design a suite based on that for you. Yay, I can’t wait to get to know more about you. Complete my contact form or send me an email at hello@mathildalundin.com. And please feel free to share any overflowing Pinterest boards you may have. I will be in touch asap about how we can make your dream wedding paper reality.